I stumbled across this paper recently as a client was asking about the effect of EM on Fusarium and I thought it would be relevant to a lot of our growers. 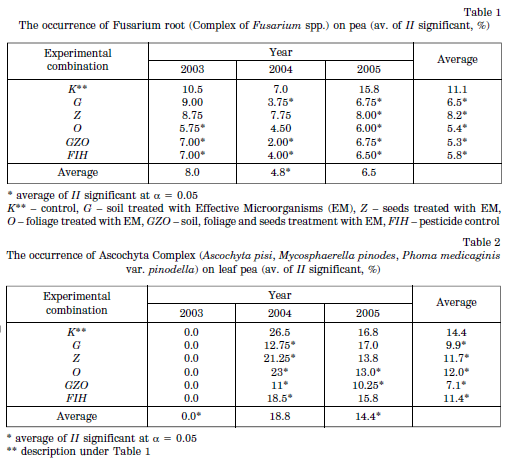 This trial published in the Polish Journal of Natural Sciences in 2008 looked at the Effect of fungal infection and the application of the biological agent EM on the rate of photosynthesis and transpiration in pea (pisum sativum l.) leaves. 1. The tested biological agent (EM) reduced the incidence of pea diseases. 2. Foliar application of EM significantly increased the rate of photosynthesis in pea. 3. Soil application of EM, seed dressing and chemical control decreased the rate of photosynthesis in pea. 4. Seed dressing with the tested biological agent (EM) and chemical control caused a significant decrease in molar transpiration values in pea. 5. The occurrence of downy mildew of peas significantly reduced the rate of photosynthesis. 6. The occurrence of downy mildew and ascochytosis of peas decreased the rate of molar transpiration.